I'm doing up a friends bike after he had it resprayed and am now re-assembling it and adding components. All the components and various bits and pieces came to me in two boxes and a bag of bolts, screws and other little parts. I have fitted most components and bits and pieces onto the bike but came across two (or possibly three) little items that look to me like bushings of some sort. I have gone over the bike but cannot for the life of me fathom where they have come from. They look very similar to the bushings that sit in the centre holes in rear derailleur jockey wheels, but they are slightly longer by about 2-3mm. Any ideas? maybe chainrings spacers ? or bushings that go into derailleur's pulleys . Two? Bottle cage stand-offs to clear a front derailleur clamp band, would be my first guess. Nope. Neither. I thought them to be chainring spacers at first, also. Take photos of the actual parts, as well as some kind of a size scale. Dimensions? Thickness? Steel, Aluminum, Brass, Plastic, Stainless, Chrome? Or clearing DT shifter cables? Perfect cylinders, I'm guessing chrome plated steel. Very similar in looks and size to the bushings used in jockey wheels/derailleur pulleys, as I've stated, but a little longer. Not related to DT shifters as the bike has STI. I think they are bottle cage spacers as has been mentioned above. I will have to take a look later today to know for sure. They look just like the bottle cage spacers I am using. Will they pass an M5 bolt? Got a Specialized dealer handy? Take them to him and ask. Measure and State: ID, OD, & thickness.. it's over due. but they are slightly longer by about 2-3mm. Last edited by fietsbob; 10-14-16 at 01:36 PM. The readers' have a certain attention span length... Andy. The readers' [sic] have a certain attention span length... Andy. Don't know if they'll accept an M5 bolt until I've tried, but I'm guessing that you are correct in your assumption of them being bottle cage spacers. You need to rein in your tone with me. Whilst I appreciate and value peoples knowledge, help and replies, I didn't ask for your help specifically or exclusively, so there's no need to come across all authoritative and orderly. If you'd have actually read my OP you would have noticed and then realised that I had typed "They look very similar to the bushings that sit in the centre holes in rear derailleur jockey wheels, but they are slightly longer by about 2-3mm." So, thus knowing the length of a jockey wheel/derailleur pulley bushing, which is about 5mm in length, then it's safe to say that the items I am referring to are around 7 or 8mm in length. If you hadn't got it by then, I also attached a LARGE photo directly underneath the text. Last edited by migrantwing; 10-14-16 at 04:00 PM. Last edited by migrantwing; 10-14-16 at 04:14 PM. Bottle cage spacers it is. End.Of.Thread. then they never were bushings , call them spacers, hence forward. I wouldn't have placed the OP if I'd have known them to be spacers, would I! If you're not going to be productive at all, then please refrain from posting. You are an annoyance, and a pedantic one at that. Last edited by migrantwing; 10-17-16 at 03:36 PM. That might be a little harsh. I think I remember Bob posting that he is retired and does much of his BF contributions from his local pub, which would explain a lot. To all those who followed this thread. 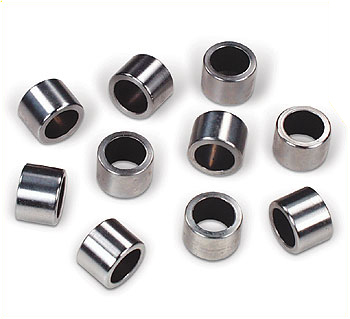 If you should have any questions about something that looks like it might be a bushing, but may not be don't use a name that implies a specific function. Folks here on BF can be very doctrinaire, and if you call them bushings and they turn out to be spacers or risers or whatever, you'll be called out. The reverse is true, so don't call them spacers if there's a chance they might be bushings after all. So you can call them whatever to friends, but not here on BF.